2017: The year AI bots learn to react to irrational human behaviour? AI gained a lot of ground in 2016 and the technology is set to be widely implemented this year. Artificial intelligence (AI) had a fair bit of air time last year – from tech imitating art in the recreation of Rembrandt’s work, to robots outsmarting humans in technical games. 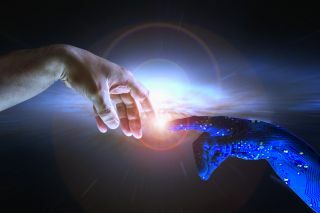 Unsurprisingly, some of the biggest names in technology are working hard to establish what AI can do for them, with Facebook, Amazon Google, IBM and Microsoft setting up a partnership to discover just that. So as we settle into 2017, what can we expect from this fascinating field of technology in the next 12 months? The fun projects and headline grabbing tests have done a great job of raising the profile of artificial intelligence, but this year we’re going to start seeing some more interesting movement in real-world applications – with gaming, driverless cars and smart cities standing out as three industries that are ready to be boosted by developments in AI. The UK is desperate to be a leader in this space, with the new Chancellor Philip Hammond promising to invest £390 million into the autonomous cars sector in his first Autumn Statement. £100 million has been set aside for testing, but the success of this investment depends on defining the specific type of testing to be used. So far, manufacturers have focused on creating vehicles and testing possible outcomes, (largely using decision trees) to program a vehicle’s responses to any given scenario. This method relies on pre-defining all the variables and testing those eventualities. As well as being expensive and time consuming, the problem with this approach is that no one can predict every possible eventuality which could occur, leaving autonomous vehicles open to undetected vulnerabilities to which vehicles would not know how to react. Before money is spent on manufacturing potentially flawed vehicles, investment needs to go towards testing the technology in a virtual environment using artificially intelligent bots powered by machine learning. Not only will this form of testing ensure that every possible eventuality is accounted for, but it also enables autonomous vehicles to continuously learn and adapt to their environment. Testing powered by reinforcement learning will mean smarter and safer vehicles, and will ensure that the government’s investment stands the best chance of making the UK a true leader in this space. There are also a number of ways in which smarter AI models can help to transform smart cities. AI has the potential to transform how we go about protecting our cities from threats. Simulations can be set up to allow homeland security teams to identify weak points. Once these weaknesses have been identified, city planners and security teams can take action to protect themselves and make smarter planning decisions in the future. This same approach can be used to test changes to infrastructure, such as the new runway at Heathrow, or the proposed pedestrianisation of Oxford Street. The ability to visualise exactly what that impact is using a wide range of data points – such as information about weather, people and vehicle traffic, seasonal peaks etc. all needs to be considered before decisions can be made. Using AI simulations to measure the exact impact of a new development using a wide range of data points. When it comes to gaming, reinforcement learning will help the industry to overcome the issue that all manufacturers are battling with: maintaining player interest. Building the optimum level of difficulty to keep a player engaged is a science: make the game too easy and players will lose interest, but make it too challenging and the average gamer will give up, feeling glory is impossible. What’s more, this optimum level of difficulty differs for every player. Reinforcement learning introduces sophisticated skills matching to gaming, enabling the game to adapt to the individual player – presenting challenges that suit their abilities and preferences and offering a tailored gaming experience. With the introduction of next generation AI technology, we’ll also see entirely new approaches to characters and storylines evolving this year. Picture zombies able to interact with each other, scheme and devise collaborative approaches to defeat you – now that would be scary! The gamer could even negotiate with the enemy, meaning even the resolution of the game is unpredictable, with additional sub-plots emerging alongside the main plot. Conversely, a player could get bots on its side, creating pets or forming his /her own army of intelligent bots to target the enemy. Much of the earliest research into AI focused on perception: Can a robot tell that a dog is a dog, or identify a specific person? This has been solved, with robots able to detect objects far more accurately than humans can. Next generation AI technology focuses on decision making: How should bots react to humans? Reinforcement learning moves on from decision trees, enabling the bots to learn genuine responses, which aren’t based on limited pre-set options. As we move further into 2017, AI is going to get even smarter – going beyond uncovering how bots should react to predictable behaviour, to building bots that can react naturally to humans when they behave irrationally. It’s going to be an exciting 12 months – watch this space!